I TOTALLY forgot to hit publish on this yesterday, so let me get it up today. Just pretend you are reading this on Wednesday. Jafronius gets a healthy stack of Cooperstown for his collection. 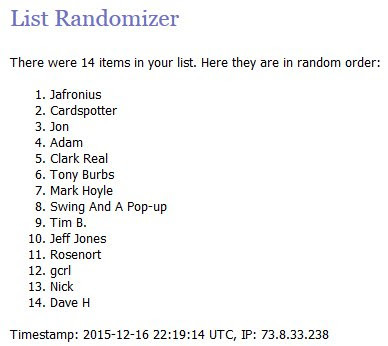 I'll hold off mailing under all the cards are randomized as Jafronius may win a 2nd time and thus get his choice of cards. Alright, let's get to today's stacks, but first - a story. Yesterday was a bad day at work. The day started with all the data from one of our largest customers not routing properly. That blew the ever living crap out of the phones - 10+ minute wait times. With an issue like this, it wasn't a simple "we are researching the issue" response. We had to collect information for another department to research. On every single call. Fortunately, I work the chat queue. Which means, at one point in time, I had 15 cases I needed to escalate. In chat, you can take as many "calls" at one time as humanly possible. My limit is 4. There is just too much going on to handle changing your troubleshooting mindset that often. One of the best parts of chat opposed to the phones is when we are getting killed, their scores look dreadful, and we usually are sitting at 100%. It's the advantage of being able to take 3 and 4 chats at a time. However, yesterday was not one of those good days. Our scores were pitiful in chat. When you are working 4, and 4 other people are working 4, and there are still 6 chats queued up, cursing is how you handle stress. Well, it cleared up about noon, only to have some bizarre internet issue throw everything back into the crapper. I enjoyed the 30 minute lunch I happened to get to about 5 minutes before all hell broke loose again, then leaped back into the mess. By the time 3:30 rolled around, I needed a drink. Bad. 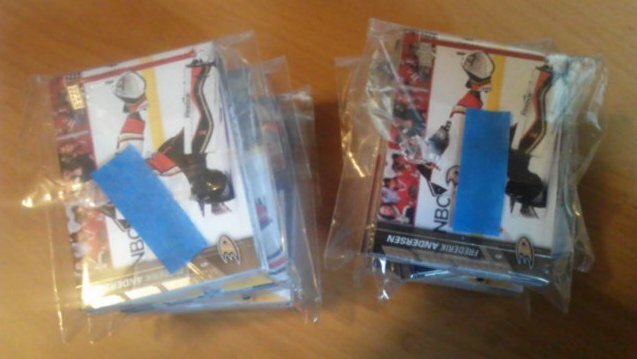 That is two separate stacks of 2014-15 Upper Deck hockey. 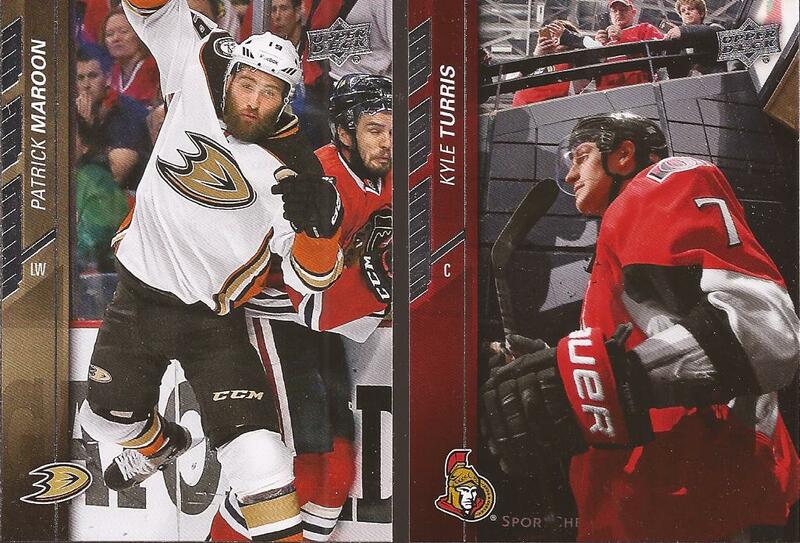 This is one of those giveaways where the person at the top, and the person at the bottom, walk away with cards. I believe it's 135 cards per stack. No inserts and no dupes (I pulled them out). So for a 200 card basic set, you are getting almost 70% of it. Not sure why I keep trying to pull this card. 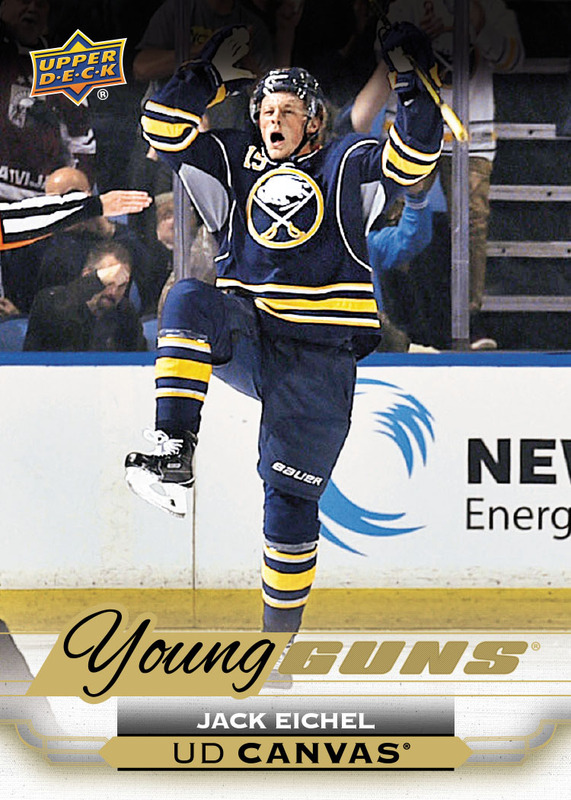 Hell - he's not even leading the rookie scoring, nor is the Young Gun card that will come out in Series 2, Jack Eichel. Right now, the leader for the rooks in scoring is this guy - a little winger that I've pulled two Young Guns cards for already. But still I buy packs, and pull dupe after dupe after dupe. And I say "sonofabitch"....then buy another pack. It's like crack. 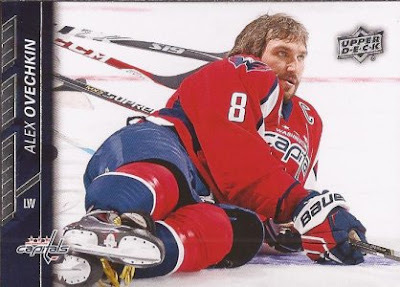 Luckily, Adam at Addiction As Therapy (seque FTW) helps me out with other hockey cards. I am just two cards away from completing series one thanks to a recent mailer from him. Upper Deck knows images. Adam also helped with my Update series needs. 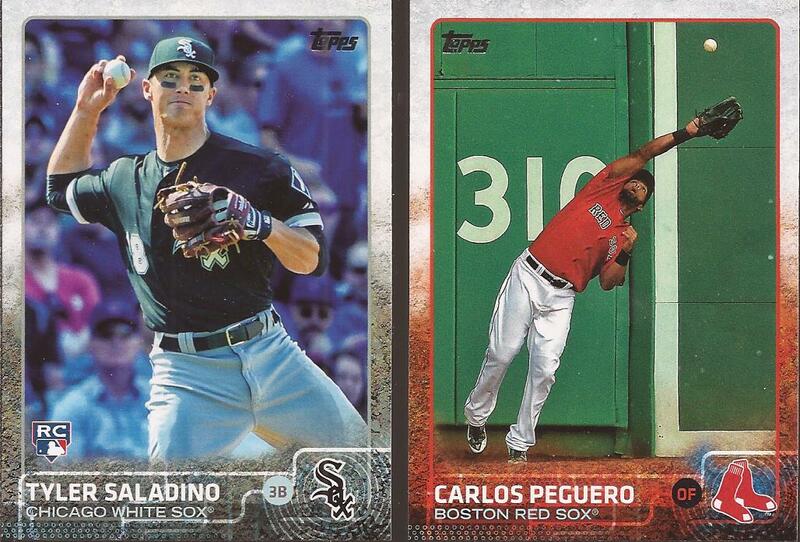 Not sure is Saladino is the answer for third base on the south side. And considering we JUST traded for Todd Frazier, I'm not the only one thinking that. 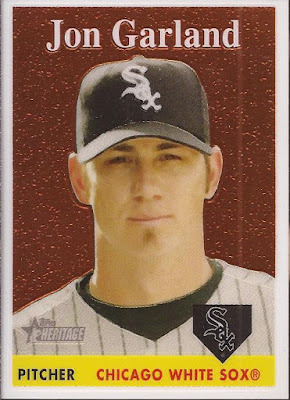 Adam topped it off with a nice chrome version of Garland from a past release of Heritage. Thanks again for the cards, Adam. I'll throw my hat in the ring for one of those UD lots! I like Saladino but like you, I'm not sold on him. I fear Frazier will fall off the map like every other superstar we've signed lately. BTW - Love that song, heard him play it on the Tonight Show and immediately added it to my playlist. P-town finally wised up and got a decent radio station (similar to WXRT), but it took a guy from the music biz to migrate south from Chicago. The new station introduced me to that song and I can't get it out of my head. Thanks for perpetuating its stay. I'm in for anything hockey. That song is my current favorite thing in music right now. I'm in for hockey too! Count me in - and that song is an absolute killer, I can't help but belt it out whenever I hear it. those are stacks of 2015/16 UD... but yeah.